"NASA’s super-secret spaceflight to the Dark Star is barely a third of the way into its fifteen year mission when things begin to unravel. Tensions between the crew of Ezekiel One and their mysterious mission controller, Etienne Lille, are building, with potentially disastrous consequences. "Meanwhile, on Earth, an unexpected lead brings journalist Bill Bainbridge back into the hunt for the location of the Dark Star - information which will blow apart the entire conspiracy. Without his knowledge, his actions are being guided by a tangled web of Military Intelligence operatives, aided by the enigmatic “Tall Man”, Nathan Keye. "When the Ezekiel One black project runs into serious trouble, a third power emerges, aided by the uncompromising Followers of Horus. For the first time in millennia, humans experience how it feels to become slaves of a god. "As Ezekiel One finally approaches the planet Nibiru, the crew wonder how things could possibly get worse…"
'The Followers of Horus' is the sequel to Andy Lloyd's first novel, 'Ezekiel One'. It moves from an espionage thriller into the realm of science fiction. The Egyptian god Horus is of course a centrally important member of their ancient stellar religion. Born in the sky of Isis (Sirius), each Pharoah was thought to be an incarnation of the god Horus. 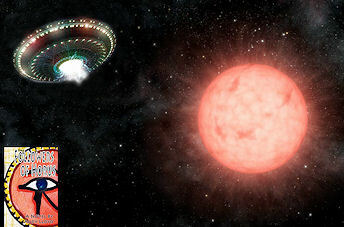 So symbolically I portrayed the brown dwarf as Horus (the son of the Sun), Horus also represents the re-born god Marduk, who appears on the spaceship Ezekiel One on it's way to Nibiru. I have only ever come across two references to the Followers themselves - in a book by Adrian Gilbert entitled 'Magi' and in an essay by Freddy Silva's on ancient sites across the globe, built to aid the transformation of an individual into a god. Freemasons are the modern Followers of Horus, he claims - not unreasonably. Gilbert's essential idea was that the Biblical Magi were part of a wider brotherhood anticipating the return of the Horus-King. I've extrapolated that concept fictionally to a modern super-secret cult within the Roman Church. The above image is based upon a scene from the book. As the black project space mission Ezekiel One nears its goal, a welcome committee from Nibiru approaches. Their interest lies solely with the living cargo carried aboard the spaceship. The cover for the book was taken from a painting I made (right). 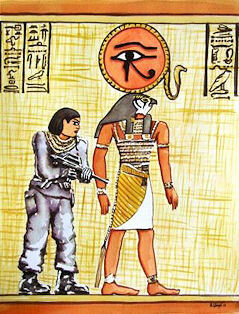 The original painting depicts a modern warrior appearing on a ancient Egyptian papyrus - as a Follower of Horus, literally. Well, the Followers of Horus in the book aren't dressed in this way, but the feel of violence and conflict that surrounds them is true to the novel. "When Bill Bainbridge, reporter for the London Daily Standard, was pulled off restaurant reviews in 2012 to investigate wild NASA UFO conspiracy theories, little did he know that he'd still be doing it six years later. "True, he and his friends uncovered the UFO -- a giant, top-secret nuclear-powered spaceship called Ezekiel One, built by NASA and crewed by U.S. astronauts. But soon enough the ship slipped from the view of earth-bound astronomers and headed into the great unknown. "The events of 2012 were covered in Andy Lloyd's first science fiction novel called, appropriately enough, "Ezekiel One". 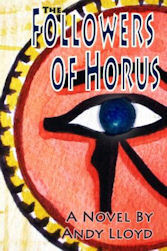 The sequel, called "The Followers of Horus", begins with Bill trying to meet up with an Italian astronomer. Bill's employer, a Russian tycoon named Mr. Provotkin, very much wants to know the coordinates of the mysterious Dark Star, the purported destination for the spaceship. However, anyone on the verge of finding out tends to end up either comatose or floating face-down in a river. Very powerful interests want the Dark Star to remain secret, and they'll stop at nothing. "Bill was very paranoid in 2012, and rightly so -- he survived at least two assassination attempts. However, he's gotten sloppy, lulled into complacency by years of fruitless investigations. In his heart, he's fed up with the whole thing and just wants to go back to reviewing restaurants. By the end of the first chapter, we'll see how disastrous Bill's carelessness turns out to be. While a good portion of the earlier half of "The Followers of Horus" focuses on the search for the Dark Star on Earth, an equally important plot line follows the voyage of Ezekiel One itself. This dominates the latter half of the book. "The trip is to last fifteen years. The crew consists of relatively young men and women who are beginning to feel the tedium. Having completed their spectacular flyby of Saturn and passed beyond the orbit of Neptune, there is really nothing now for them to see through the transparent glass observation dome, apart from the Milky Way. Day to day, nothing ever really changes. The ship feels motionless. 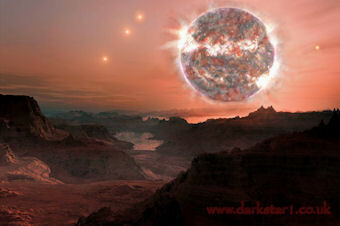 The Dark Star, actually a giant planet called a "sub-brown dwarf", is far too dim to notice. There is a very small amount of artificial gravity produced by the slow, but steady, acceleration of the ship, but it is not enough to prevent significant bone and muscle atrophy. The human body is not designed for prolonged weightlessness. There are exercises the crew members are supposed to perform, but they're getting lackadaisical. Also, a need for secrecy means that, for long time, the ship is cut off from radio contact with Earth. On-board food production is starting to falter, and people are feeling the hunger pangs. Foolishly -- and against clear orders -- they have begun to have children. "One major source of tension is the fact that only the commanding officer, Bradley Pierce, knows the true nature of the mission. There are twelve priests on board, all schooled in the ancient Sumerian language. Supposedly, they're to serve as ambassadors for humanity when Ezekiel One reaches Nibiru, a planet-sized moon orbiting the Dark Star. However, they are keeping watch over a secret cargo, in a no-go portion of the ship. As increasingly mutinous crew members hatch a daring plan to shorten the voyage and, perhaps, save themselves from starvation, Pierce tries to dissuade them. The priests will not accept any shortcuts, but Pierce can't tell anyone why. Before long, tensions will build to the crisis point, and the crew will learn a terrible secret. "I have known about Andy Lloyd for the better part of a decade, thanks to his "Dark Star" book and website. I always figured that his theories about a hidden binary companion to the Sun would make good science fiction novels, and Andy for the most part has delivered. I first read the books last fall, and have just finished them a second time. I enjoyed a couple or three exciting run-for-your-life chase or escape scenes. I also enjoyed some subtle humor, such as the absurd Monty Python line translated into Russian. "A major character, known to Bill Bainbridge as the Tall Man, has a surprising amount of clout. His audience with the Pope is quite unconventional -- he doesn't exactly go in through the front door. And when a character jokes that he's an alien with cool space tech -- well, maybe he isn't really kidding after all. I especially liked the vivid descriptions of Nibiru orbiting in close proximity to its primary, bathed in ruddy or magenta light, looking very much like the Eye of Horus of ancient Egyptian lore. "The plot does suffer from a few flaws. The one that sticks most in mind involves a very dramatic scene where the major villain reveals himself -- and he talks like Yoda. It just doesn't quite project the right kind of menace. But after this he mainly stays in the background and lets his henchmen terrorize the protagonists, and the story starts clicking again. Andy also could have used another couple of eyes looking over the text. "I know from firsthand experience how hard it can be for a writer to ferret out those pesky typos. Also, at one point the names of a mother and her daughter were transposed, stopping me cold until I figured out what was going on. 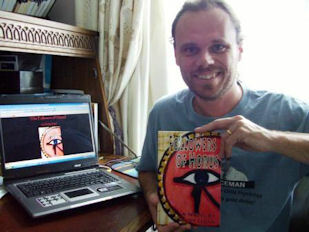 Signed, dedicated copies of the book can now be obtained directly from the author, Andy Lloyd, who is based in England.